The federal bill addressing non discriminatory network access in the energy sector will significantly reform the existing legal framework for grid operators in Germany. A crucial aspect of the reform is the strengthening of rules for vertically integrated energy companies active in production and distribution as well as grid operation. In her publication, Dr. Camilla Bausch critically analyses and evaluates unbundling rules for the electricity sector against the background of lawmakers' objectives - including promoting competition, reducing conflict of interest cases and quelling market distorting activities. 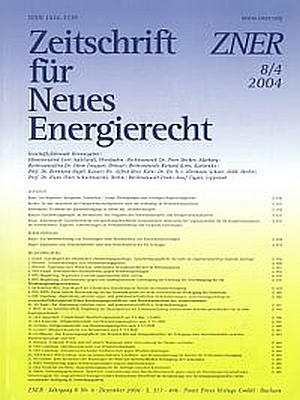 European Union Member States were to incorporate the rules of the so called Gas and Electricity Acceleration Directives into national law by mid 2004. The Directives leave the Member States substantial implementation lee-way, but nevertheless require significant strengthening of existing German unbundling rules. The proposed bill strengthens, and thereby improves, unbundling rules, even though Germany is - as it did for earlier reforms of energy law - focusing on minimum European requirements. Thus, the new rules will serve to reduce conflict of interest cases, cross subsidies, forbidden information flows and discrimination by network operators in the energy sector. However, conflicts of interest and thus incentives for market distorting activities by vertically integrated grid operators will continue to exist. Whether the new rules will lead to substantial short or medium term structural changes in the German energy sector remains questionable because of numerous exceptions applicable especially to distribution systems operators. In the article, Dr. Camilla Bausch compares the advantages and disadvantages of the draft unbundling rules. Bausch, Camilla 2004: "Entflechtungsregeln im Stromsektor. Die Vorgaben des Gesetzesentwurfes zum Energiewirtschaftsrecht". Zeitschrift für Neues Energierecht, Vol. 8, No. 4, 332-342.